This article is about the microgame in WarioWare: D.I.Y.. For the minigame featured in WarioWare, Inc.: Mega Microgame$!, see Fly Swatter. For the original Mario Paint minigame both "Fly Swatter"s are based on, see Gnat Attack. Info "Swat these annoying buzzers!" Fly Swatter is one of 9-Volt's microgames in WarioWare: D.I.Y.. 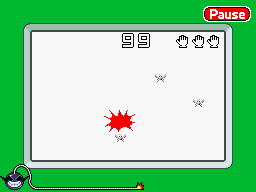 This microgame is based on the video game Mario Paint Gnat Attack. The point of the game is to kill the three insects that float on-screen. The player needs to tap them in order to kill them. Occasionally, a Big Fly or a Dragonfly flies onscreen. They are easier to hit because they are bigger than the other flies. If the player kills all the insects before time runs out, the game is won. However, if the player fails to kill all the insects and time runs out, the game ends in a loss. This page was last edited on July 16, 2018, at 12:31.